Over three hundred and seventy years ago my 10th Great Grandmother Penelope Van Princin stepped off a ship with her husband, after traveling over the sea from Holland. They came to a new world that we now call America, for opportunities and freedom. Penelope had a strong faith in God and wanted to live free to worship Him and His son Jesus Christ. There is not a lot of information about Penelope before she crossed the waters, but her story after shows that she was a woman of faith, love and forgiveness. Their ship had gone aground not where they were supposed to land. Shortly after landing her husband was sick and hurt and couldn’t continue with the other passengers to find shelter. Penelope was left alone with her husband in a new place, with next to nothing with them. Penelope and her husband were promised by the other passengers would come back for them. Not long after being left alone Penelope and her husband were attacked by Native Americans. They had been warned about the Natives and were told if you stayed away from them they would stay away from you, but it became obvious very quickly that these men were not coming to them in peace. Penelope’s husband was quickly overtaken and didn’t suffer long before he was killed. Penelope was tortured. She half scalped, her arm was cut and she was disemboweled before she finally passed out. The Natives thought she was dead and left her there naked and alone. 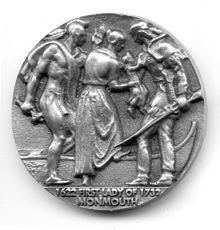 A coin made to represent Penelope Stout of New Jersey. Penelope woke in pain and afraid. She was terrified as she realized that her bowels were on the outside of her body. She pushed it back in as best she could with one hand and used her other hand to crawl to find food and shelter. Penelope found solace in a hollowed-out tree and spent her time there. She prayed to Heavenly Father to take her from this life. She said that she wasn’t strong enough to suffer anymore. 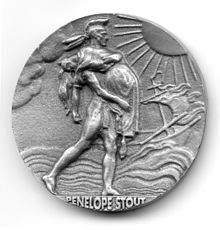 Penelope saw the sun rise seven times until one day she saw a deer running with an arrow through it and two Natives running after it. At first she was scared, but realized that her prayers were answered. They could finally end her pain and take her life. Of the two Natives there was a younger man, and an older one. As the younger one began yelling in a different tongue towards her, the older man shouted back and the young man stopped. The older man came up to Penelope brought her closed to him and put her over her shoulder. Penelope passed out. Penelope born 1622 and died 1732. 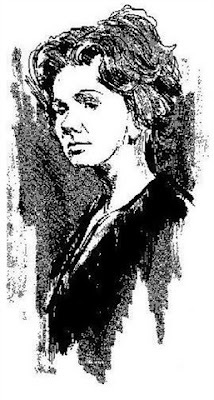 She and her husband settled and lived in Monmouth, New Jersey. Penelope woke to several Natives surrounding her, she panicked, but quickly realized they were not trying to harm her. They were trying to help her, heal her. Penelope was being sewn on her belly to keep her bowels inside her body. Days and weeks past and the older Native man became like a father who truly cared for her. There was kindness and love that embodied those people and she was able to forgive the others that attacked and killed her husband. Penelope eventually went back to the “white people” and met and married my 10th Great Grandfather Richard Stout. Together they lived in New Jersey and she continued a friendship with the Natives that healed her. Miraculously she healed fully except for scars and had limited use of her arm. Penelope gave birth to ten children and she lived a full life until she passed away at 110 years old. Penelope taught her children, grandchildren and generations to come, how to have faith, love, hope and to forgive. I will always love Penelope and I know that strong woman in my family line is somewhere in me. I’m not perfect, but I try to do my best to show her how much I appreciate her sacrifices and the life she lived so well.